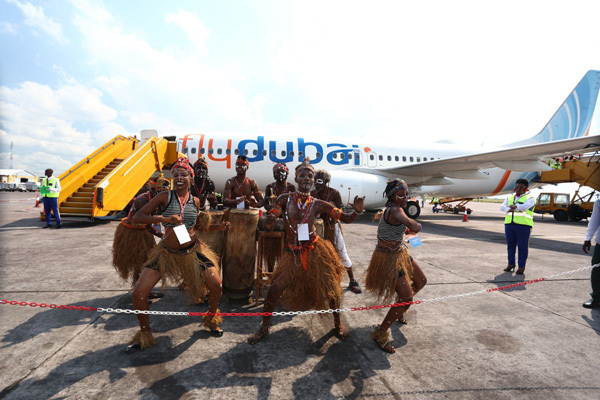 Flydubai’s inaugural flight touched down yesterday at N'djili Airport (Kinshasa International Airport - FIH). Following the launch, flydubai will operate daily flights to N’djili Airport with an en route stop in Entebbe. Flydubai is the first national carrier for the UAE to create direct air links to the Congolese capital, Kinshasa, and with the start of the service sees its comprehensive network in Africa grow to 13 destinations in 10 countries. With the start of flights to Kinshasa, another gateway is opened up for passengers from the GCC, Russia and the Indian Subcontinent into Central Africa. Passengers from Kinshasa have access to more than 90 destinations on the flydubai network and through its codeshare partnership with Emirates can connect easily and conveniently to Emirates’ destinations spanning six continents in over 80 countries. The inaugural flight touched down at 14:20 (local time) and on board was a delegation led by Sudhir Sreedharan, senior vice president, Commercial Operations (UAE, GCC, Indian Subcontinent & Africa) for flydubai. The delegation was met on arrival by Tshiumba Pmunga Jean, director general, Civil Aviation Authority; Kufula Makila Rex, cabinet director, Minister of Transport and Constant Bopima Moelo, cabinet director, Minister of Tourism.